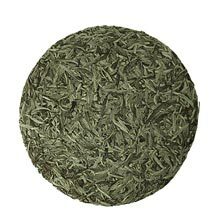 Yin Zhen tea cake is made from lightly oxidized, still-closed Da Bai (Great White) tea buds, which were compressed into the shape of a round disc for easy storing and aging. The tea plants where the buds were picked from grow in high mountains, 1000 meters above sea level in Fuding County. There is a Chinese saying "San Nian Yao, Qi Nian Bao", which describes white tea as being medicinal after 3 years of aging, and becomes a treasure after 7 years. White tea aged for 3 years is said to be good for preventing body heat related illnesses such as sore throat and flu. After 7 years, it is said to be good for concentration, stomach illnesses, vision and has anti-aging properties. The tea is smooth and lightly sour with a hint of floral sweetness in the aftertaste. We recommend adding a bit of rock sugar or honey.